The Collect API records events from a game, these events can be tracked using the deltaDNA online dashboard Measure and are used Analyze player behaviour and personalize the player experience with Engage A/B tests and targeted interventions. The API offers two operations. One generates the Unique User ID and the other records all the event triggered from the game. A userId is an ID that is unique to a user. When you don’t have your own userID in your game, generating a UUID is the preferred way of creating one. You would then be required to store the returned value locally on the client and reuse if for all future Collect calls from that specific client. The deltaDNA REST API has a method for generating a random unique userID that can be used for his purpose. When you already have an ID the user can be identified by you can use this value. However more often than not there are either legal restrictions or limitations due to licensing restrictions that prevent storing the apparent userID at a third party. Creating a hash of this id and using that as a userID for the integration will in most cases be a workaround to this problem, this prevents having to store the userID again. An Environment Key is set for each new application that is created and set of Custom Events can be configured per application. Initially you will be accessing our Test Server and once integration and testing is completed your application will be enabled on our live servers and a new URL and Application Identifier will be provided to you. In the body of the request specify a JSON document corresponding to the event type, as described in the following section. Two URLs give us two options to receive the events. First one is a simple one (recommended for testing) and the second one more complex using hashing. The latter one is to verify the authenticity and the integrity of the event and is advised for production. Hash is a 32-digit MD5 hash created from the JSON event string with appended a Secret Key (known only by the customer and deltaDNA). If the status code is 204 No Content, the event has been successfully received by the server and there is nothing that the server wants to send back. userID : Every event must contain a userID, this is simply a unique string that identifies the player and is consistent across their subsequent play sessions. Please see the paragraph above on generating a unique userID. sessionID: The sessionID is an optional parameter on all events. It should contain a unique string value that is persisted for the duration of player gameplay session and regenerated with each new gameplay session. The sessionID should be sent with every event the player triggers in their session. The deltaDNA platform will then use the sessionID to calculate the number of sessions each player plays, the length of each session etc.. There may be occasions when you wish to send events containing valuable player information outside a player session and don’t have access to a sessionID. These are called GHOST events and you should omit the sessionID parameter and value on these events to ensure that they are not included in any player session calculations. Typical examples of GHOST events would be attribution events or transactional information originating from 3rd party services. eventUUID is an optional parameter which should be unique for each event. Adding the eventUUID will prevent the event being inserted twice within a 24 hour period. This would be the case when for example a network time-out occurs even though the event has been processed. Using a unique eventUUID for each event will prevent this from resulting in multiple events within the platform. yyyy-MM-dd HH:mm:ss.SSS ±[hh]:[mm] where the ±[hh]:[mm] can be included to indicate a timezone offset from UTC. Parameters which are not required don’t have to be included in the document. They can be omitted all together rather than sending empty or null parameters. It is possible to send multiple events in a single POST, indeed this approach is preferable due to efficiencies in connection pooling etc.. Please keep the POST length below 5MB, anything above may be rejected. The format of each individual event remains the same, however they are represented in an eventList array containing individual events. Please note, the events inside a bulk event list should be ordered in the order they occurred. The transaction event contain arrays and some special product objects that you will encounter when the player buys, trades, wins, exchanges currency and items with the game or other players. The good news is, the structure for this is fairly standard and the following event is as complex as it gets. The following transaction event records the player using some real world currency to purchase a treasure chest containing some virtual currency and multiple items. We will also take advantage of deltaDNA revenue validation with the Apple store and Google Play store to check that the transaction is valid. For more information on Apple receipt validation please see the iOS SDK documentation and for Google see the Android SDK documentation page. As you can see the structure of the transaction event is a bit more complex. It contains a couple of Product objects for recording productsSpent and productsReceived. It is also worth noting that the currency value is always sent as an integer in the minor currency unit and the realCurrencyType is an ISO-4217, 3 character currency code. This event may be more complex but the structure is logical, flexible and provides a mechanism for players spending or receiving any combination of currencies and items. In the body of the request specify a JSON document corresponding to the test request for this decision point. "missionName": "First Time User Forest #2"
It is possible to have events and engage coming from both the client and a server. In this case traffic from the server probably should not be considered as real gameplay and by omitting the SessionID the engage call will not be considered player activity when it comes to analytics. This prevents retention and DAU charts to be influenced by calls from the server. 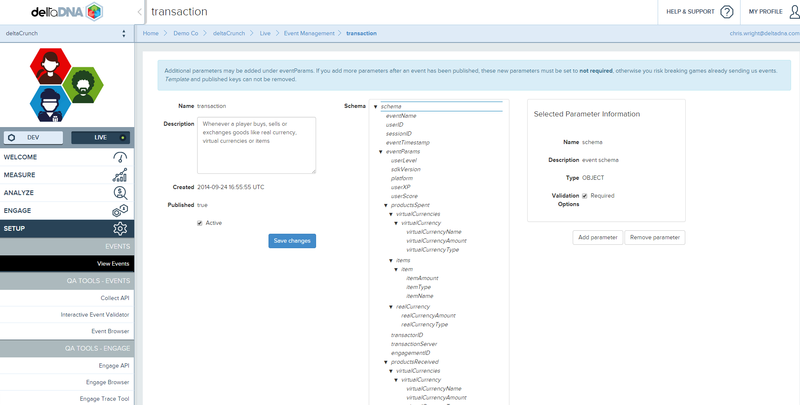 The platform parameter is optional, and in a hybrid integration it is advised to only set the platform on the client. The parameters object is required even if no parameters are configured. The following error codes will indicate any problems with your A/B Test request. 400 – Inputs malformed or missing in some way or you are sending real-time parameters that haven’t been added to your game parameters list or are being sent as a different parameter type than specified in the Game Parameters manager. 403 – secret hash key incorrect or Engage is not enabled on your account. Please check that you have the “On-Demand” package enabled on your Game -> Packages page, you may need to get the Account Owner for your deltaDNA account to do this for you. A successful response will contain a JSON document with a transactionID, an eventParams object containing the campaign details and a parameters object that contains any parameter keys and values specified in your campaign action. Test Variant A – Control group (or anybody with an unknown userID), contains an empty parameters block. Test Variant B – Contains a parameter object with parameter keys and values that the game can use to personalize the game play experience for this player. The game should be able to resort to a default value if no response is received from Engage within an acceptable time. Requests should be made to Engage in an non-blocking manner in case the service is unavailable. DeltaDNA supports sending push notifications for both iOS and Android. The Android and iOS SDK will help to send back the required token/registration but when using the REST API you will have to send this back yourself. When you’ve retrieved the token on the device or on your back end server then this should be reported back to DeltaDNA in the notificationServices event. For iOS you will have to make sure the pushNotificationToken is populated and for Android the AndroidRegistrationID.